We at BOOSTane understood what was unreliable about other boosters on the market, and we focused our attention on making sure BOOSTane answered those problems. With other products, sedimentation eventually occurs, and the formula’s components settle to the bottom of the can. This results in decreased performance and can clog fuel filters and pumps. How is BOOSTane’s formula different? The answer centers on our proprietary chelated carrier, which makes BOOSTane perform better than any other booster. With BOOSTane, our anti-knocking agents remain suspended indefinitely in solution. This helps deliver the incredible advantages that we sought to provide. First, there is no need to worry about the shelf life of BOOSTane. No matter its age, your can of BOOSTane will deliver reliable performance without harmful sedimentation. Second, BOOSTane’s revolutionary chelated carrier allows us to include a higher-concentration of anti-knocking agents in the formula. Our expert engineers have developed the most reliable, consistent, and high-performing octane booster on the market; and we’ve confirmed it through independent 3rd party testing. 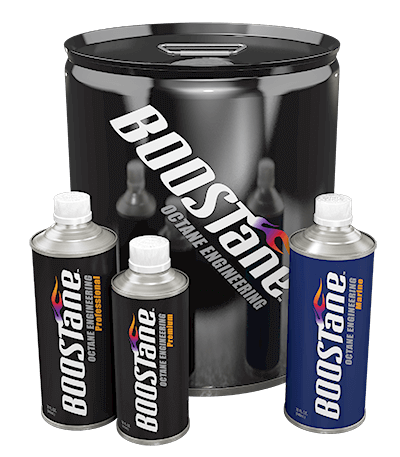 With BOOSTane’s formula, you’re buying an octane booster that delivers consistent results and is also good for your vehicle’s engine. That’s exactly what we set out to do.